Published in 2000, Limited edition print sold out. Collectors Series currently out of stock. Limited edition print sold out. This was my third London painting published as a limited edition print and it sold out as quickly as the first two; 'Memories of London' (1996) and 'London Revisited' (1998). 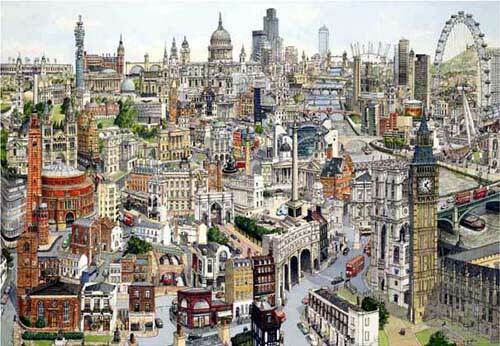 The demand for my unusual cityscape paintings meant another visit to view this ever changing urban scene in the spring of 2000 and seven months later the Millennium London painting was complete. My imaginary view for this composition is loosely taken from the west including buildings and landmarks in Chelsea, Victoria, Kensington and Westminster in the foreground; the spectacular London Eye and the South Bank including the Tate Modern; with the City and northern districts receding to the background. I have become associated with the capriccio style, and on finding a sandwich bar in Soho named after Canaletto felt I should honour the forerunner of this approach ( though less extreme than mine) by including it in this London print.